My favorite Christmas moment was the last one before I fell hard asleep. As if he would understand that I only bark at those I love. In the moment this picture was taken, this delicious moment after I emerged from bed to take it, my adult daughter and son had returned from checking on two pooches that my son was babysitting over the holidays. He seemed too tired to drive so my daughter, his older sister, agreed to go with him. 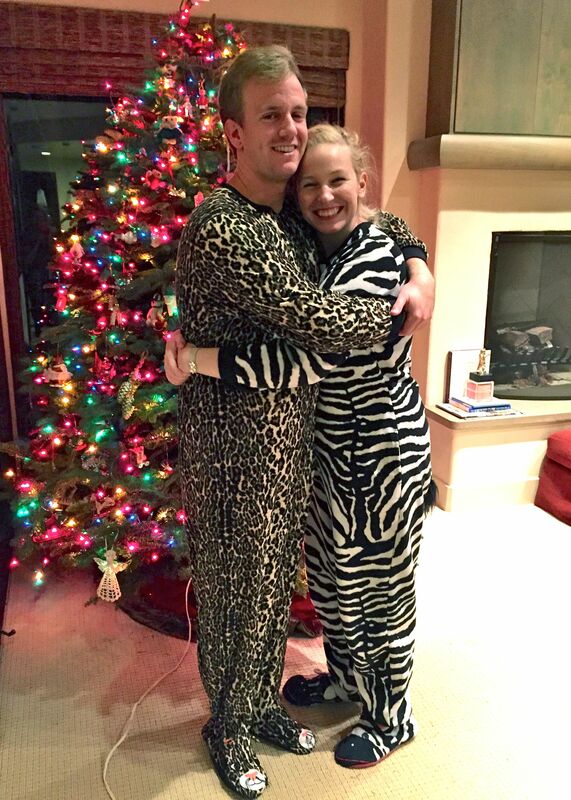 When they returned, they had concocted the idea to take a picture in front of the tree in his-and-hers animal onesies. They could hardly stand, they were so tired. I could hardly stand. But I’m so glad that I got out of bed to say goodnight just as my daughter was telling her brother that no one was around to take the picture. Then they saw me: problem solved. Pictures were taken: arms flung wide, arms wrapped around each other. They’ve been this close since the beginning, a true gift to one another. Why is it that I just figure Christmas out — remind myself what the season means — about the time it’s over? Until then, it seems, there’s just so much work to do to make it perfect for everyone. Or (let’s be honest, Betsy) to make it perfect enough for my own standards. I’d been feeling overwhelmed. Broken. With my son applying to teach English in Japan, it had been like college app season all over again, characterized by my own frantic feeling that I needed to make sure he didn’t miss a step. He wanted this, after all, so I was all in. I know what they tell parents — it’s supposed to be their problem, not ours (there’s yet another “should” from whoever “they” are) — but I’m terrible at disconnecting. So I was sitting in church feeling like a failure, like a rotten mother who, in her effort to ensure that things got done and done right, was turning the holiday season into boot camp. Instead of offering love, I was draining it. Ninety percent of the time I’d been in bitchy mode; the other 10 percent I tried to make up for it. As the week continued, I couldn’t stop thinking about the blessing of the Advent candle. About precarious and fragile places. About brokenness. Was this a reminder that love conquers all? That I could make all things right with enough love? No, I had it on its head. It was a reminder that I was loved — am loved — even in my fragility and weakness. Even when I confuse motherhood with sovereignty. God’s love could surpass my smallness? The way I sometimes fail in mothering, the most important role entrusted to me? Here were my children, standing by the Christmas tree, engulfing one another in a hug, goofy in zebra stripes and leopard spots. Here it is, I thought, what Christmas is really all about. Love, just love. If only I let it in. Christmas 1971… and man, was it the 70s! Perhaps the worst losses are the ones that we don’t expect: the children who die before their parents, the young mothers or fathers whose lives laid ahead of them, the mothers we expected to be in our lives for so much longer. With these premature deaths, we wail with no less intensity than the mourners of ancient Rome, albeit through all the ways that we communicate now. Whether poured out in text messages, or emails, on Facebook or by telephone, it is awful to behold, and worse to feel. With the loss of my “other mother” in October, I find myself compelled to unpack some Christmas decorations that I haven’t displayed in years: my mother’s angels. Back in the 50s and 60s, my mother collected small angel figurines that she displayed on a bed of “angel hair” (spun fiberglass) that glowed from the string of tiny white lights beneath. Each was lovely, but one in particular stood out: a small girl angel, clad in pink, rosy cheeked, curly haired, head bowed, hands clasped in prayer. In the past few weeks, I have borne witness to and experienced that stabbing kind of pain that comes with unexpected loss: the continuing fallout from the death of a young mother to alcoholism, the sudden loss of a joyous and loving young father, and my “other mother,” Miss Ann. My other mother’s family gathered to make her favorite foods and set the table just as she would have, harvest colored candles arrayed on her heavy brass serving tray. My friend who lost her childhood buddy to addiction wrote a eulogy filled with beautiful stories of her wit and strength. My friend who lost her brother, the young father, raises beers to him to re-enact the fun times when they met at the Whole Foods Bier Garten. These moments were nothing like scenes from a TV drama in which survivors look beautiful while they delicately weep in their time of grief; they were – and are – red-eyed, snot-riddled affairs where people try to do something, anything, to make a terrible reality less terrible. In reliving traditions – even privately – we summon the people we have lost, the people we feel we should not have lost. Are we hoping that their ghosts will be with us as we go through our rituals? Do we imagine that they will be near as angels, hovering over our lives? I think my mother imagined Midge as an angel, captured in the likeness of the little pink-clad figurine.